Last night (Sat., July 9, 2016), Brock Lesnar and Mark Hunt squared off at UFC 200 inside T-Mobile Arena in Las Vegas, Nevada. In a solid performance, Lesnar took the decision win. Find out how below! Ultimate Fighting Championship (UFC) Heavyweight bruisers Brock Lesnar and Mark Hunt collided last night (Sat., July 9, 2016) at UFC 200 inside T-Mobile Arena in Las Vegas, Nevada. Lesnar may never contend for the title again, but he’s guaranteed excitement and must-watch television. One-off deal or no, the mixed martial arts (MMA) world was more than excited for the return of Lesnar in the unofficial main event of UFC 200. While there may not be any divisional implications for Lesnar, Hunt’s situation was a different story. If he was able to defeat the WWE superstar, Hunt would certainly experience a serious push of momentum towards the title mix. To watch Brock Lesnar vs. Mark Hunt full fight video highlights from UFC 200 last night click here! After a cautious start from both men, Lesnar committed to his first real takedown attempt, driving Hunt into the fence. He completed the double leg and denied Hunt’s stand up attempt, placing him back on the mat with authority. On the ground, it took a minute or so for Lesnar to open up, but he did so violently. Hunt used those strikes as an opportunity to scramble up to his feet, but he took serious damage and the round expired before he could capitalize. It was a strong round for the former champion. 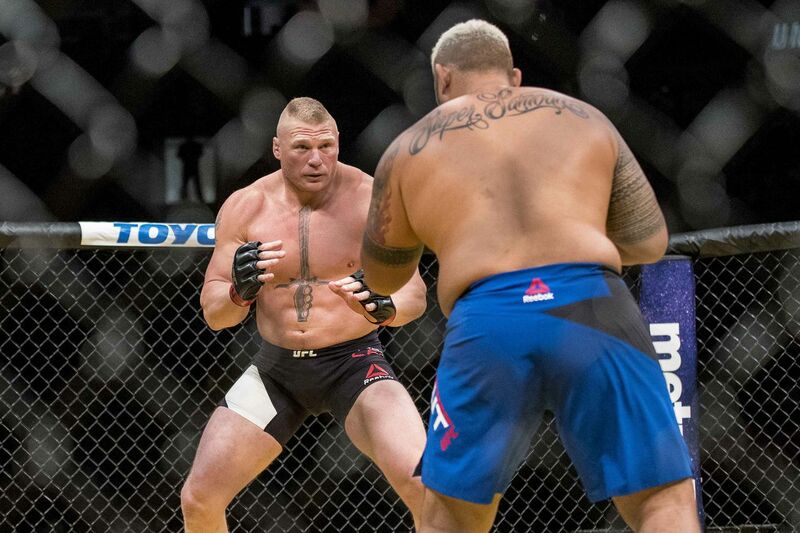 Lesnar looked a bit tired to start the second round, allowing Hunt to stalk him around the Octagon. Hunt was patient and didn’t really throw anything, but he also defended a trio of takedowns before stepping up the aggression a bit.